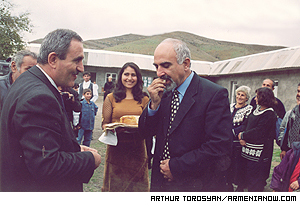 Aleksan Hakobyan and Paruyr Harikyan at the renaming ceremony of the school in Kashatagh. She may be Miss World in the hearts of her national fans, but Miss Armenia Lusine Tovmasyan will miss out on a chance to prove her beauty in the international competition unless she gets $12,000 fast. "This year Armenia has an exceptional opportunity to participate in the 'Miss World' beauty contest". "I don't think that there is a way to find the money in Armenia," Aristakesyan said Wednesday. "I applied to about 30 people, but no result." Aristakesyan appealed to Miss World organizers and they agreed to extend the fee deadline until November 26 for the December 6 competition. The 17-year old Miss Armenia is devastated by the turn of events, as she learned of the financial shortcomings only a day before she was supposed to leave. "I had my luggage packed by the 7th of November and I was in the mood for departure," she says. "And all of a sudden, just before the departure I was phoned and told that I was not going." The beauty of the year instead is still attending classes at Interlingua Linguistic University, trying to avoid the curious questions: "When are you leaving?" and "Aren't you going to participate?" "I wish I was told a little earlier that there are financial difficulties. I wouldn't so much dispose myself to leaving. A couple of weeks ago I went to the embassy and got my entrance visa, and we were trying to solve the problem of dresses, but the organizers did not tell me that they can't pay the small membership fee." But what may seem "small" to a teenager with dreams of world acclaim, is quite another matter for organizers. Their entire Miss Armenia 2003 pageant was produced for a budget of $15,000. Her apparent absence from Miss World comes as especially hard news for Lusine, as she has already been bypassed for a chance to compete in the Miss Europe competition last week in France. Armenia was represented there by Anush Grigoryan, who was runner-up to Lusine in the Miss Armenia pageant. Expecting to send Lusine to Shanghai, organizers here sent Anush to the competition, where that entry fee was just $400. (The total cost of her trip was $5,000.) Anush was not among Miss Europe winners. Jury member of Miss Armenia 2003 pageant, Vilen Galstyan, thinks that Lusine has good chances for success at Miss World, and that it would have been be more reasonable not to participate in Miss Europe to save the money. The deputy minister defended the decision to send a contestant to Miss Europe, saying that the $5,000 still would not have been enough for the Miss World expenses. Aristakesyan says he is busy trying to come up with the money, because if Armenia does not participate in the contest this year, the organization of Miss World will not take Armenia seriously in future pageants. "They will probably not take away our participation license, which was very difficult to get. But it will be really embarrassing. We represent a country" says Aristakesyan. Lusine's application was sent to the Miss World organizers and according to the pageant website (http://www.santabanta.com/contest.asp) she is in the lineup for the title. But the website may have to be edited unless $12,000 appears before Wednesday. While the organizers try to find the membership fee for participation in Miss World, the disappointed beauty every day reads the conditions presented by Miss World for the competition. The rules say each participant should have 30 cocktail and 20 evening dresses (each dress costs at least $150-200), shoes of the same quantity, bathing suits, etc. "The funniest point is where it is mentioned (in the competition guidelines) that: 'If you are coming from your country by plane, and it is possible for the luggage to get lost, make sure that the participant will have enough money to buy everything necessary from here'," says Lusine. "If I had that much money I would pay the membership fee and participate with only one dress."